Dr. Po-Fang Chang, a Taiwanese saxophonist, is a passionate champion for the diverse canon of art music as well as music education. With great enthusiasm in contemporary music, he dedicates himself as an advocate to performing new music and commissioning works for saxophone. Chang received his DMA from University of South Carolina, Master of Music and Certificate of Music Performance from Bowling Green State University, and Bachelor of Arts in Humanities and Social Sciences from National Tsing Hua University in Hsinchu, Taiwan. His primary teachers include John Sampen, Clifford Leaman and Chih-Huan Wu. In 2014, Chang was a finalist in the International Saxophone Symposium and Competition (ISSAC) in Columbus, Geogre. Chang won the 1st prize of J. C. Arriaga Chamber Music Competition with the Harmonium Saxophone Quartet in 2011, and the Bowling Green State University Chamber Competition with WCJC Saxophone Quartet in 2010. He also won the 2nd price of Hsing Tien Kong Music Competition at Taipei, Taiwan in 2001. As an active musician, his performances have been throughout Asia and the United States. He gave solo performances at multiple North American Saxophone Alliance Conferences, YAMAMA Artists Service Center in Taipei, and featured soloist Yasong Wind Ensemble and Taiper Municipal Jianguo High School Alumni Wind Ensemble. As a chamber musician, he performed with Abraxas Saxophone Quartet in Southern Exposure Concert Series at the University of South Carolina in 2013. He was invited as a guest artist in the Composition VII Saxophone Quartet in 2012, performed the Taiwan premiere of Michael Colgrass’s Urban Requiem at the National Concert Hall in Taipei, and as a member of HyperPrism Saxophone Camerata, performed in World Saxophone Congress XV in Thailand, 2009. Chang is currently a member of the MIT Saxophone Ensemble. Dr. Chang is Assistant Professor at Soochow University (Taipei, Taiwan), National Kaohsiung Normal University (Kaohsiung, Taiwan), and National Hsinchu University of Education. 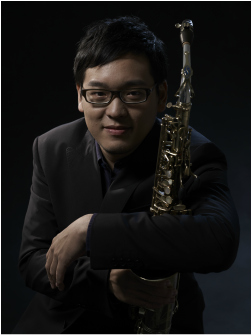 Chang is a D'Addario Woodwinds artist and performs exclusively on D'Addario reeds.